[En] Deepblue Records are proud to present yet another huge up and coming talent to the labels ever growing roster of quality artists. UK based Akira Kayosa has seen support from pretty much every major DJ out there and his productions have appeared on some of the worlds biggest labels and playlists. Henrik Melender from Sweden joins Akira in creating this wonderfully crafted EP. With releases on UK imprint Resonate and huge support from Armin Van Buuren the pair of them combine to create an awesome release for Deepblue. When the Deepblue team first heard the Alpha State EP we fell in love with its unpretentious but infectious persona, this combined with some of the finest production standards in the industry today, it became a sure fire winner in our eyes. First up in the EP is Alpha State, this fine piece of trance clearly demonstrates the high standard of musical magnitude offered in this package, clinical key drum programming back by huge soaring pads and falling piano riffs, all topped off with a perfectly crafted lead melody that will have you humming along in seconds. Beta State continues on the same form, keeping the high standard of production and feel. The major difference is the mood, though still hugely uplifting and driving, the focus is on the break down. Through soaring pads youll discover an enchanting but mellow riff drawing you before the track builds to a huge climaxed finish. Simply put, this EP is massive! 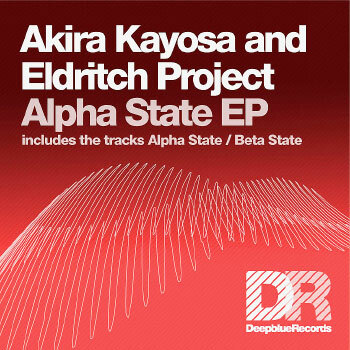 La description de l’album Alpha State Ep de Akira Kayosa and Eldritch Project n’est pas disponible actuellement. Commentez cet album et gagnez des cartes de téléchargement gratuit et/ou des Ipods Apple.